From broadcast graphics, software development, creative design, computer and networking systems, and event operations, SMT’s signature services set the benchmark for golf technology. SMT’s scoring system, GolfX, is the industry standard for tournaments worldwide. GolfX is a real-time, proprietary turnkey scoring system for golf, and includes a wireless mesh network, handheld scoring devices, administrative software and hardware, pairings generation and distribution, scoring servers, and data feeds. SMT utilizes real-time data from SMT’s GolfX or the PGA TOUR’s ShotLink to creatively display scoring information in real-time to tournament fans. SMT’s GolfTeeV service is a multi-panel display presentation that combines live video with tournament scoring information. The GolfTeeV channel is delivered across an IPTV or RF system and can be displayed in the clubhouse or dining lounge, so participants can view the tournament leader board, tee times, team information, and other scoring-related information. NextGen Scoreboard Control (NGSC) is SMT’s automated production system for providing live scores, stats and results. The system is designed so that it can be customized to match the specific needs of each client. SMT’s turnkey Pro Am Draw Party service includes an administrative system for ingesting professional and amateur player information, random draw creation, custom displays to match tournament branding, associated Pro-Am reports (pairings, scorecards, etc.) and tournament pairings management. SMT provides Tournament Information Systems for fans, tournament officials and media, giving them access to real-time scores, players stats, pairings/matches, schedules and tournament updates. SMT can design a custom application to the specific requirements of any event for any sport. RangeFinder, SMT’s GolfX ball position system, is a complete laser-based ball location service that captures the location of the ball in 3D space, measuring the distance from where it comes to rest to key elements such as the hole or another player’s ball. This data is used in on-site productions, as well as provided to internet and broadcast clients. SMT also develops many graphic solutions for displaying the ball location in a compelling manner. SMT provides the lasers, mounts, greenside handheld tablets, administrative software and software. Optimizing the latest in new camera technology, SMT’s Greenside Tracking System is on-course to capture the data of an incoming ball’s approach - from green, to landing, to roll. This data is then provided to the scoring system where it is used in on-site productions, as well as to digital and broadcast clients. SMT’s real-time, custom on-course and in-venue display productions are frequently used on the PGA TOUR and PGA TOUR Champions events. SMT has multiple video wall production solutions ranging in complexity to appeal to any tournament large or small. SMT uses ENG camera work, video editing and distribution to capture special events for tournaments, including player interviews, client testimonials and tournament promotional materials. SMT also provides on-site tournament highlights termed “Moments Ago,” packaging exciting plays on the broadcast feed and quickly editing the video material to display on SMT video boards throughout the course. SMT’s in-house design entity, SMT Creative Studio, specializes in the creation and implementation of compelling content presentation for the on- and off-site audiences, including video displays, broadcast and digital platforms. These state-of-the-art graphics presentations include real-time 2D/3D HD animations, virtual and augmented reality graphics. Our graphic content production capability ranges from the latest render and animation systems to systems that deliver content for perimeter displays and broadcast clock-and-score bugs. In addition, SMT provides customized channels that integrate directly into existing tournament CCTV systems. SMT’s suite of virtual (augmented reality) enhancements for golf include broadcast graphics and virtual studios. For live broadcasts, SMT can display an assortment of content such as live tournament statistics, sponsor placements and virtual ads, and groundbreaking services such as Drive Grid, a product inspired by the yellow first-down line that highlights drive distances. Other fan favorites include SMT’s Landing Zone graphic that predicts where a tee shot will land; PuttVision, which offers a 3D model that displays the optimal putting line while highlighting the topography of the green; and Chipping Circles, a set of three yellow circles that illustrate the proximity of a player’s chip to the hole. SMT’s on-site operations teams are highly skilled at working side-by-side with golf production crews to provide SMT’s on-site or broadcast solutions for virtually every golf tournament, from the spectacle of the Waste Management Phoenix Open to the prestigious Open Championship. SMT’s expert remote technical teams understand the expectations of producers and directors and the challenges that come with working in a live TV environment. Whether working in studios, remote trucks or in-stadium, our teams work well under pressure and maintain self-composure and integrity, easily adapting to changes that are inherent in live productions. With next-generation technology and deep-seated expertise, our teams provide installation, maintenance, and troubleshooting to ensure the highest production value possible. SMT has built a comprehensive interactive solution for the media, integrating real-time and historical information, live video and archived tournament footage and player interviews. Our Tournament IPTV Platform Service (TIPS) provides custom messaging and sponsor opportunities while keeping journalists apprised of every development. SMT provides the software, hardware, creative development, staffing and equipment required to execute this fiber network service. In addition, our LED displays and graphics make our services a must-have for large events. SMT’s Video Production Services team is comprised of Emmy-winning broadcast specialists who use a producer’s eye to help clients produce engaging and compelling content for their distinctive audiences. 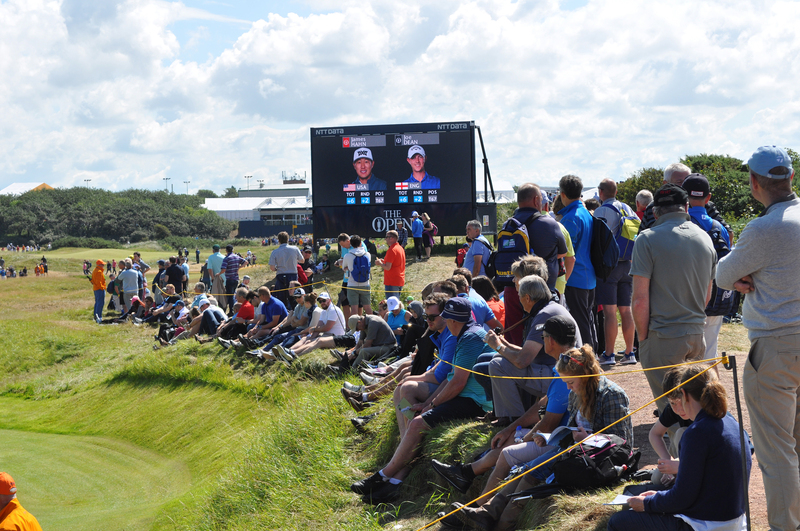 Golf fans at select tournaments are treated to SMT’s Monsterboard productions, LED video boards that display standings and custom “Tee to Green” productions that provide fans with up-close views of each player from the moment of the tee shot through the final putt. SMT’s Social Media Walls feature the live broadcast and social media content from fans. SMT’s fully staffed Help Desk and Data Operations Center support clients at every level of a golf production. SMT offers pre-event setup and configuration support, technical support, and is available for post-show attention as needed. Our operations teams are skilled in product set-up procedures, system operating procedures and general hardware/software troubleshooting procedures for resolving normal issues encountered in the field. Working in tandem with our QC group to analyze and troubleshoot engineering, production and operation functions, our expert staff helps clients execute flawless broadcast and events. With SMT’s commentator support, on-air talent is instructed on how best to use our off-camera information systems to deliver expert analysis during play, in replay or post-show. Our systems offer an array of current and historical data, statistical and real-time information, providing on-air talent with an in-depth look into each player’s strategy. SMT provides ongoing training for employees and clients, both on-site and from our simulated production truck environment at our headquarters in Durham, N.C. Our instructors replicate a remote production environment in which to learn and practice various aspects of live golf broadcasts, while our Training and Certification department offers a plethora of training videos, websites and testing for our certification program. SMT instructors design, develop and deliver comprehensive training programs unique to each client.